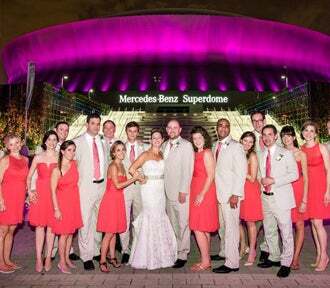 The Mercedes-Benz Superdome offers additional options for event programming and meetings with smaller attendance figures: the Premium Bunker Club Lounges, the 200 Level Club Lounges, and the Corner Office Sports Bar. These spaces routinely accommodate a wide range of events including: corporate meetings, theater style presentations, private or public receptions, school dances, and weddings – just to name a few. These luxurious areas are equipped with high-end furnishings and state of the art sound and audio visual elements to make your event seamless from start to finish. See below links for information on hosting special events in the Premium Bunker Club Lounges, the 200 Level Club Lounges, and the Corner Office Sports Bar. For more information or to receive a customized proposal, please call the Sales Department at (504) 587-3663, (800) 756-7074 or email [email protected].